For many years, Susan has been interested in cross-artform collaborations. She has worked especially closely with printmaker Pat Gregory on several joint exhibitions of poetry and linocut prints/pen-and-ink drawings. The work resulting from their collaborations has been shown at a wide range of galleries in England and Wales, including ONCA gallery in Brighton, Oriel Canfas in Cardiff, Waterloo Tea in Cardiff and Penarth, Oriel Cric in Crickhowell, Theatr Brycheiniog in Brecon and the Library Gallery in Haverfordwest. All of the poems and visual art feature in Susan’s most recent collections, skindancing and Where the Air is Rarefied. Digital prints and greetings cards of some of the most popular images and poems are also available for purchase. Please contact Susan for further information. Splendid – imaginative poetry and exquisite images. I’ve enjoyed this exhibition so much. Love the poems, love the prints, want to take them all home with me to relish. Thank you so much. Am inspired all over again. Congratulations to both these wonderful artists! So interesting and inspiring. Congratulations. A really inspiring collaboration, so much to see and taste and hear. Thank you! Superb work, quite magical – make sure you show it elsewhere! Susan has long been a fan of lyricists such as Cole Porter, Ira Gershwin and Irving Berlin so when she met a jazz singer-songwriter who was keen to work with a poet-lyricist and who just happened to share her name, embarking on a collaboration seemed like the obvious thing to do! Sue Richardson is an acclaimed vocalist and trumpet player who has gigged at major Jazz Festivals throughout the world. 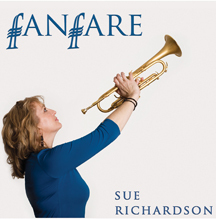 The two Sues have already co-written a number of songs, all of which feature on singer-Sue’s third CD, Fanfare. The lyrics of original songs such as ‘Walk on Gravel’, written by the trumpeter’s namesake, the poet Susan Richardson, are buoyant and witty – The Times.